Among key demographic groups, 46 percent of men, 45 percent of whites and 41 percent of seniors give Trump a thumbs-up, versus 35 percent of those ages 18-34, 33 percent of women, 26 percent of Latinos and 8 percent of African Americans who do. 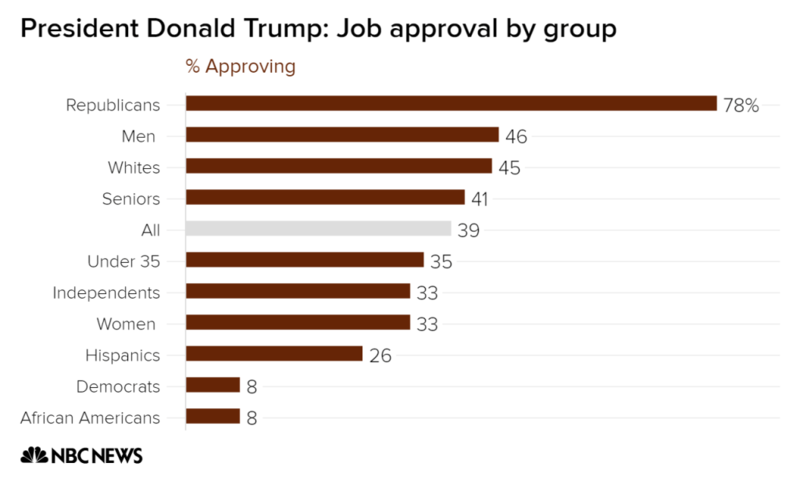 By party, 78 percent of Republicans approve of the president’s job performance, compared with 8 percent of Democrats and 33 percent of independents. Trump’s overall approval rating of 39 percent in the NBC/WSJ poll is lower than George W. Bush’s (82 percent), Bill Clinton’s (60 percent) and Barack Obama's (50 percent) at this same point in their presidencies. Trump’s job rating in last month’s NBC/WSJ poll was 41 percent. The new NBC/WSJ poll was conducted January 13-17 — after the controversy over Trump’s profane words about immigration from certain countries, during the possibility of a looming partial government shutdown and before the president’s one-year anniversary in office on January 20. Asked which words best described how they felt about Trump’s first year as president, respondents' top answers (allowing for multiple responses) were “disgusted” (38 percent), “scared” (24 percent), “hopeful” (23 percent), “proud” (12 percent) and “angry” (11 percent). "A dumpster fire," said an independent male from California in summing up Trump's first year in office. "He does not represent the values of the country," added a female Democrat from Wisconsin. "He has no compassion and he should not be our president." "I am in awe that he has done so much in a year," said one Republican female respondent from Georgia. 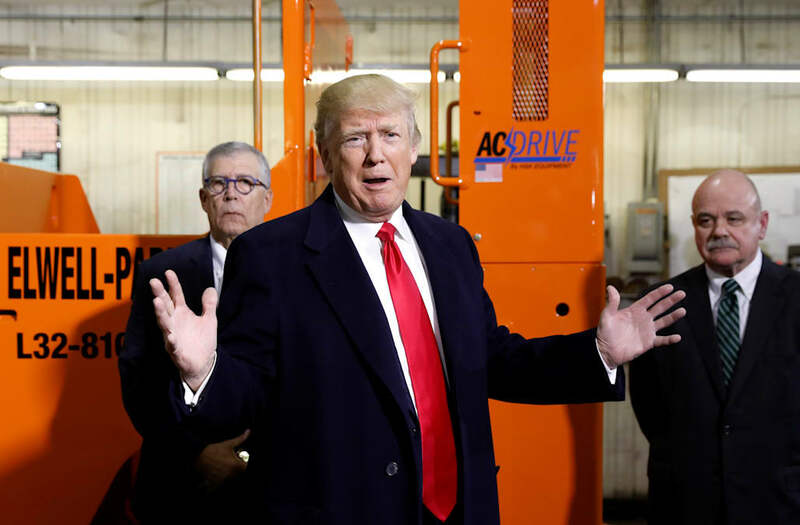 "I think he's doing the best he can with all the negative or fake news, and all the Democrats and Republicans that are against him — the establishment Republicans," added a Republican female from Alabama. And when asked which one or two accomplishments made them feel the most positive about Trump, 20 percent cited a strong economy and low unemployment; 13 percent said “putting America first;” 10 percent said the tax legislation that Trump signed into law late last year; and another 10 percent said the military successes against ISIS in Iraq and Syria. But 37 percent of Americans said none of the potential responses made them feel positive about the president.